In lieu of recent wildfires in California this past Friday, the LA Rams were forced to cancel practice and the Oakland Raiders were limited to just a walkthrough. With the utmost attention to the safety of Rams and Raiders players, coaches, staff, and families, practice conditions were not suitable as an estimated 75,000 homes have been placed under evacuation orders as a result of the Woolsey Fire. Forty-five people in the Rams organization were evacuated from their homes, including 20 players and coaches. Meanwhile, affected by poor air quality from the Camp Fire in Northern CA, the Raiders were also forced to adjust their schedule from what was supposed to be a full practice. The NFL issued a statement on Friday saying that they are “monitoring conditions in California and are in close communication with the clubs and local authorities,” but Sunday’s games are still scheduled to begin at their regularly scheduled times (espn.com). The Rams (8-1) are scheduled to play the Seattle Seahawks (4-4) at the L.A. Memorial Coliseum on Sunday. Located 55 miles southeast of the practice facility, the Coliseum is unlikely to be affected by the fires or the subsequent poor air quality; however, teams executives have been in communication with the NFL in case the situation were to change. Elsewhere, the San Francisco 49ers moved Friday’s practice in Santa Clara up an hour because of the air quality being affected by smoke. The team remains in contact with the NFL ahead of Monday night’s game against the New York Giants. The devastating fires come a day after a mass shooting that claimed 12 victims at the Borderline Bar and Grill in Thousand Oaks, which is just over 4 miles from the Rams’ practice facility and 7 miles from the team’s headquarters in Agoura Hills. This past Saturday, the death toll in the Camp Fire in Northern California rose to 23. 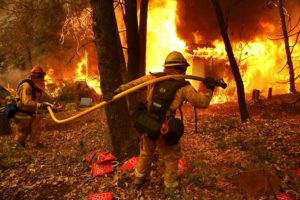 Saturday brought a break in the fierce winds (30 to 50 mph) that have whipped the three major wildfires in California that have destroyed a record number of buildings and displaced more than 300,000 people. Organization are on the ground with food, water and other relief supplies for all affected. Visit https://publicgood.com/media/cnn/campaign/help-those-impacted-by-california-wildfires to donate (cnn.com).